Young adults are stressed out. Well over 40 percent of young adults had a clinical psychiatric disorder, often resulting from stress, in the past year. Mental disorders resulting from elephantine levels of environmental stress, the sum of massive debt, high performance expectations and hyper-awareness of national and global issues are a national epidemic, and the effects can be seen as locally as Georgia State’s campuses. “We’re forced to busy ourselves to exhaustion to get just an inch ahead of our peers…So I’m forced to spread myself super thin with many different organizations and underpaying jobs in order to gain as much experience as possible and fill up my resume. It’s gotten to a point where I am looking at about 10 different calendars between them and I can’t keep even one straight,” Tristan Fernandes, a student studying political science at Georgia State, said. The effects of stress aren’t exclusive to the development of mental disorders; chronic stress can result in subtle deficiencies in the brain and damage to the body that shouldn’t be ignored, in spite of societal pressures. When you’re overwhelmed and anxious about looming deadlines or long work hours, your brain releases the stress hormones glucocorticosteroids, among other neurotransmitters. Over time, stress leads to a decrease in brain volume and mass that is suggestive of underlying damage to other parts of the brain. Memory is the brain function most sensitive to stress because the brain region responsible for memory has the highest concentration of these stress-related receptors. Due to stress hormones’ potentially toxic effects, when our brains are exposed to them for extended periods of time, our ability to recall events, remember locations and even learn are impeded. Thus, there seems to be a case of diminishing returns when it comes to taking classes. Study too much and too long, and you damage your brain with stress. Damage your brain with stress, and you hinder your ability to study. This is decidedly counterproductive for most students in college. Fortunately for students everywhere, the hippocampus is also one of the most resilient parts of the brain and is known to regenerate when the source of damage is removed. For example, though depression can lead to shrinkage of the hippocampus, antidepressants and remission from the illness can help restore the hippocampus to its original size. Less resilient, however, are other cognitive processes. Elevated stress levels can cause long-term cognitive deficiencies, including reduced IQ and cognitive disorders. Stress may disrupt cognitive processing by activating the autonomic nervous system, referred to as the “flight or fight response.” These adverse effects are typically seen only at steep levels of stress, including traumatic stress and chronic stress. Again, the cognitive-suppressing effects of severe stress are counterproductive not only to studying but also other forms of work and extracurriculars. Trying to cram 17 credit hours of coursework, an internship, a part-time job, volunteer work and emotional support to your friend who went through something heartbreaking, for example, can result in your not being able to accomplish any of these tasks because you literally don’t have the mental resources to do so. “My mind has been trying to keep track of so many different things that I’ve become more forgetful than I have ever been in my life … I have found myself losing my train of thought consistently when talking to my friends and I only know how to talk about work. It sounds ridiculous but I have even had recurring nightmares about failing at all these responsibilities,” Fernandes said. Janavi Ramesh, a master’s candidate in neuroscience, echoed Fernandes’ sentiments. 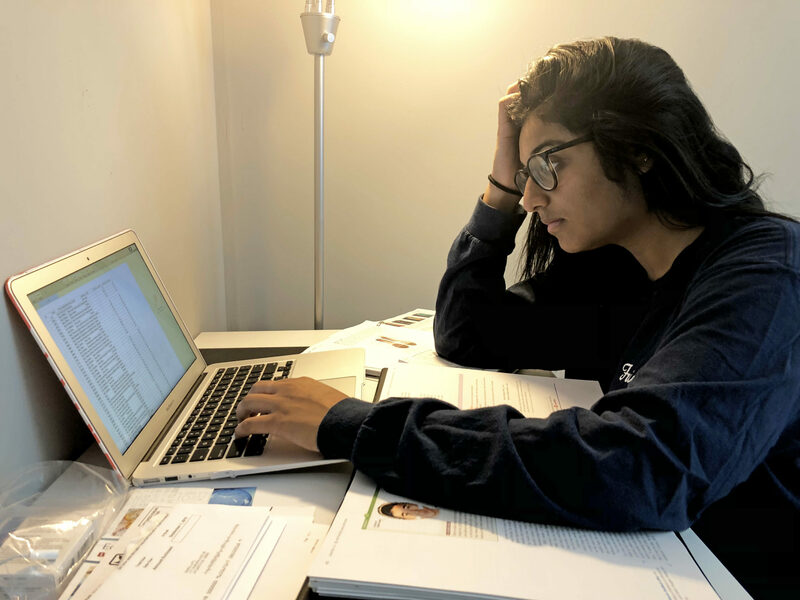 She said that when she is overwhelmed with her coursework, extracurriculars and research, she has difficulty completing basic tasks for her jobs. “Stressed mind forecast: cloudy with a chance of tears,” is how Ramesh described her current mental outlook. The damage that stress inflicts on your body is no myth either: The gut is often described as “the second brain” for its close relationship to nervous system processes. The human gut is full of bacteria that seem to play a role in cognition. The gut also uses the same neurotransmitters that the brain does, impacting digestion and even—neuroscientists hypothesize—behavior. Studies have shown that changing the makeup of the bacteria in your gut by taking probiotics or eating different prebiotic-filled foods can cause positive, demonstrable brain changes like increased network connectivity. Other early studies have illustrated that stress can cause changes in the gut microbiome. Moreover, stress can cause gastrointestinal disruptions like constipation, diarrhea, irritable bowel syndrome, colitis and a whole host of other unpleasant-sounding illnesses. Short of changing policies and institutional systems of how people must work in order to be successful and financially stable, there may be lifestyle changes available to some individuals that can help mitigate the physical damage of stress. At the individual level, alcohol and other substances like tobacco aggravate inflammation in the brain and body, so people would be wise to avoid binge drinking on the weekends to blow off steam. A healthy diet and exercise promotes sharp cognition, positive sleeping habits and overall bodily wellness. For some people, lifestyle changes can even alleviate stress as well. There is also something to be said about a work-life balance: hobbies, like painting or playing instruments, can help people cope with stress and manage their time. At the end of the day, however, all the broccoli and carrots in the world won’t halt the root of the problem: that standards for young people are sky-high during a time when wages are minimal and security—politically, economically and socially—seems distant. “I’m a senior and almost everyone I know is working themselves to death and it is hard for us to feel anything except exhaustion. Once you see how pervasive this disease of business has become, you can see why so many students are depressed, alcoholics, and addicted to drugs,” Fernandes said.